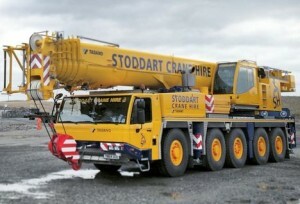 UK based rental company Stoddart Crane Hire has taken delivery of a 130 tonne Tadano ATF130G. The new crane is equipped with a 60 metre main boom and an 18 metre bi-fold swingaway extension. Maximum counterweight is 42 tonnes, while the overall width is 2.75 metres, an advantage in the Scottish Highlands region that the company serves, compared to a three metre chassis. The new unit also features multi-point outrigger settings for greater flexibility in confined job sites and Tadano’s Lift-adjuster system which automatically compensates for boom deflection to give a true vertical lift from the ground. The company, based at Muir of Ord, was established in 2004, and runs a fleet of cranes ranging from five tonnes to a 180 tonne Tadano ATF180. It has built up a wide customer base, thanks its says to a strong focus on quality and customer service. It also handles heavy recovery jobs, and supplies heavy 6×6 trucks which are frequently used to tow trucks and cranes on to wind farm sites, where the access roads are challenging and steep.